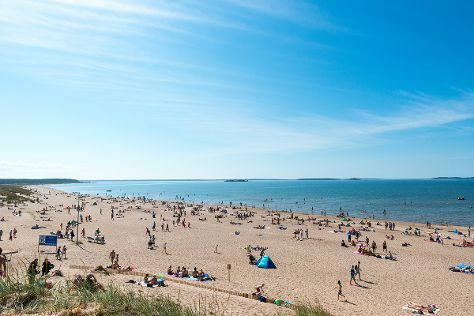 Take a break from the city and head to Hatanpaa Arboretum and Yyteri Beach. Venture out of the city with trips to Kurjenrahka National Park (in Poytya), Central Pori Church (Keski-Porin kirkko) (in Pori) and Serlachius Museum Gustaf (in Mantta-Vilppula). see Sarkanniemi Theme Park. The adventure continues: stroll through Pyynikki Park and Observation Tower, explore the historical opulence of Hame Castle, examine the collection at Vapriikin Museokeskus, and admire nature's wide array of creatures at Ahtari Zoo. To see where to stay, maps, ratings, and more tourist information, you can read our Tampere trip site . If you are flying in from United States, the closest major airport is Tampere-Pirkkala Airport. In August in Tampere, expect temperatures between 68°F during the day and 50°F at night. Cap off your sightseeing on the 10th (Sat) early enough to travel back home.